In today's world many collectors and people with tablewares made by Noritake are interested in finding out how old their sets are. In particular they want to identify the year of manufacture for a particular pattern which may have belonged to a deceased relative or simply to date their pattern/s for resale. 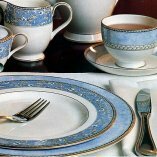 With the assistance of Noritake (Australia) Pty Ltd., we have prepared a simple pattern and date tableware guide to assist you. Some information is unavailabe at this time. As we receive updated information from time to time from Noritake AU, we will add this information. Patterns are listed in Alphabetical Order and can be accessed by clicking on the appropriate link below which will open in the window box beneath in a PDF document format. NOTE: We looked at putting this information into one file, however it is nearly 13 megs of information. So, to simplify searching we have broken the list down into alphabetical order to assist. NUMBERS ONLY PATTERN GUIDE HAS NOW BEEN ADDED and is available for viewing. This file only has numbered patterns that do not have names. Information contained will be updated as new reference material is supplied. As a courtesy we would appreciate a link if you are using this FREE INFORMATION to this page so that other sellers and collectors may be able to date their patterns. PLEASE BE PATIENT WHILE YOUR ADOBE ACROBAT LOAD PROGRAM LOADS.